It’s really a pleasure to tell you a bit about Bess and her music. But if you really want an introduction I would tell you to set a little time aside, turn off the lights, and listen to her sing Where will I Be, Taken By The Sirens or When it Don’t Come Easy. It’s really all you need to know to be captivated by a performer with a song telling style that just gets inside of you. Whether she’s playing her vintage guitar or upright base to accompany her warm vocals Bess’ performances will reach you in a way few performers can. 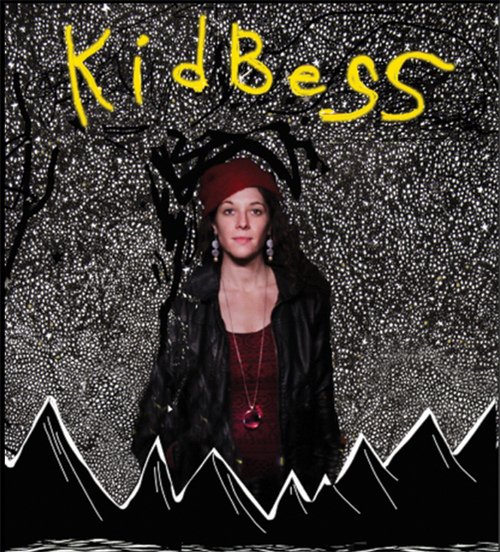 Growing up Bess recalls the love her mother had for music which makes it no surprise that at age 6 Bess was part of their family band and today she is an accomplished artist performing both as a soloist and with a full band, KidBess & The Magic Ring. In between though Bess has had a background very different then music. She’s an accomplished professional basketball player with All American Athletic and Academic honors from Binghamton University. She also has a masters in documentary and fine art photography from the International Center of Photography in NYC. And she’s developed, produced and curated over exhibits, shows and events while also serving on the Advisory Council in Photojournalism for the Alexia Foundation. But you never know where your road will lead you and for Bess at age 33 music returned to change her life with the simple purchase of a bass. The next four years would see Bess singing on stages all along the East Coast. In Bess’ own words “The more I play, the better I feel. I’ve done a lot of different things in life, but music feels endless in itself.” Keep a look out for her debut solo album this spring and make sure you catch her next performance. Thanks Bess! !